This blog post is part of an occasional series about the Gibson House Museum Archives; a repository of personal documents and photographs from the extended Gibson family. The archives are accessible by appointment; contact curator@thegibsonhouse.org to make arrangements. 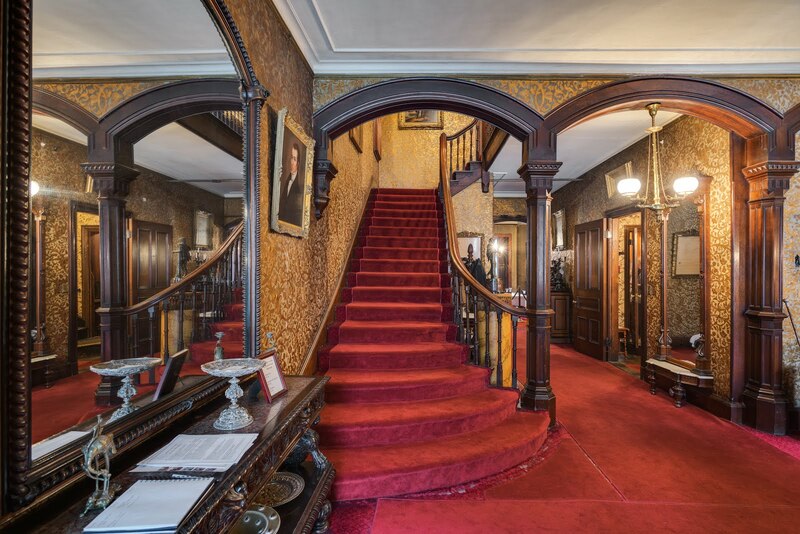 The Gibsons were not just devoted Bostonians, but avid world travelers as well. Multiple photo albums received as part of a recent donation to the museum by Gibson family descendant Rosamond Warren Allen document Mary Ethel and Rosamond Gibson’s travels throughout Europe in the early twentieth century. With the birth of their sons—Henry Freeman Allen and Warren Winslow, respectively—their travel bug only spread. The photo albums that all of these members of the Gibson family created allow us to not only look back at their distinctly personal moments, but also discern their opinions on and relationship to the world outside of Boston. 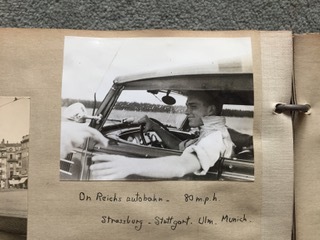 One section of one of Warren Winslow’s photo albums, entitled “My Trip to Europe: July, August, September 1939,” depicts the adventures of Warren, his cousin Henry, and their friends during a particularly contentious time in world history. Warren and Henry would have been in their early twenties at this point, probably fresh out of college and full of wanderlust. Their trip included visits to classic tourist destinations in England, Belgium, France, and Switzerland, but also Germany and Austria. The contrast of leisurely tourism with the swastikas and soldiers that appear in photos of cities such as Munich and Salzburg is particularly striking. Warren’s cohort also sought out naturalistic experiences in the beautiful Alps, and the comparative calm and normalcy of these places is perhaps more eerie. This effect is no accident. In 1933, the National Socialists passed the Law for the Reich Committee for Tourism, which established a new organization to oversee all matters of tourism under the auspices of the Ministry of Propaganda. This move demonstrates the National Socialists’ acknowledgment that travel can be an important ideological tool. Accordingly, many of the important administrative cities had elements of Nazi tourism, where people actively sought out the novelty of the new regime. Warren’s group was no exception, snapping photos of the monument to the 1923 Beer Hall Putsch (the failed coup that landed Hitler in prison) in Munich. By and large, the National Socialists pursued a policy of Gleichschaltung, or “synchronization.” Within Germany, this policy implied a desire for political conformity. From the outside, the goal was to make the international community less antagonistic to National Socialism by reassuring them of Germany’s continued normalcy. Maintaining that façade in tourists’ eyes was an inherent part this second goal. Accordingly, many of the tourist ads from the time period are completely devoid of National Socialist ideology or symbols, instead touting Germany’s beautiful historic sites, health resorts, and hospitality. Warren and his friends sought out these aspects of German tourism as well, visiting the famous Neuschwanstein castle and hiking Mt. Säuling in the south of Germany. Yet the truth could only be concealed for so long. The tone of the photo album gets increasingly more serious, with captions mentioning “war rumors” and gas shortages. Then on September 1, 1939, Germany invaded Poland and war officially broke out. There are pictures of Warren and his friends in gas masks, suggesting that people truly did not know what to expect. Ultimately, the group cut their vacation short and returned home on September 3. The reason for this cancellation is glued to the last page of the photo album: a letter from the US consulate in England, recommending evacuation and detailing procedures to do so as safely and as soon as possible. Ultimately, this photo album highlights the precise moment when Germany transformed from a place of leisure to a place of danger. Moreover, it demonstrates how the political can become personal. 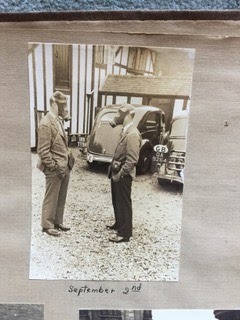 Warren and Henry would go on to serve in the war, with Warren giving his life for the cause in 1944. Perhaps this vacation was a turning point in their realization of just how dangerous National Socialism could be. While Warren and Henry were traveling abroad, it is possible they visited their cousin Mason Hammond (another extended Gibson family member), who was teaching at the American Academy of Rome before WWII broke out. Mason Hammond went out to become one of the first “Monuments Men”, advising the Allied Forces on rescuing cultural treasures across Europe. Visit the Gibson House Museum Archives to explore the fascinating stories of the extended Gibson family. Greene, Nick. “How Nazi Germany Advertised Itself to American Tourists,” 2016. Semmens, Kristin. 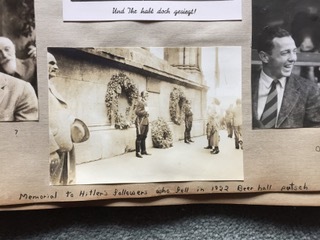 Seeing Hitler’s Germany: Tourism in the Third Reich. New York: Palgrave. 2005. Fascinating and well written article! That photo album is an amazing find...wow.